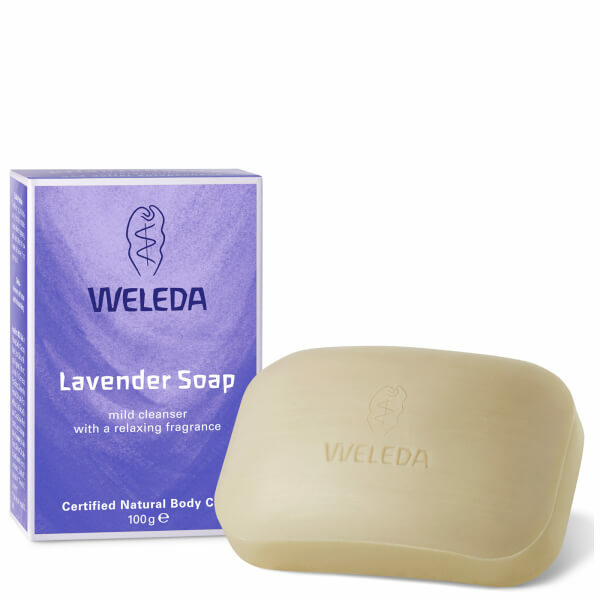 Derived from organic, natural ingredients, the Weleda Lavender Soap cleans and perfumes skin in one wash with a creamy, luxurious lather. The vegetable-based formula contains naturally-purifying Iris and Viola extracts alongside precious Lavender oil, renowned for its soothing, rejuvenating properties and relaxing, heady scent. The soap bar leaves skin feeling clean and supple with a delicate, familiar fragrance. Combine Lavender Soap with a soak in Lavender Relaxing Bath Milk to prepare for a restful night’s sleep. Sodium Palmate, Sodium Cocoate, Water (Aqua), Sodium Olivate, Fragrance (Parfum)*, Glycerin, Iris Germanica Root Extract, Chamomilla Recutita (Matricaria) Flower Extract, Viola Tricolor Extract, Oryza Sativa (Rice) Extract, Lavandula Angustifolia (Lavender) Oil, Malt Extract, Sodium Chloride, Sodium Stearate, Alcohol, Limonene*, Linalool*, Citronellol, Geraniol*, Coumarin*. * from natural essential oils.